The largest synagogue in Safed is situated in the new Breslov neighborhood complex. This imposing building overlooks the Old Cemetery and the graves of the tzaddikim; the holy rabbis of old like the Ari and Yosef Caro. Rav Gedaliah Kenig, father of the current Breslov spiritual leader, was told by his mentor, Rav Avraham Sternhartz, that bringing the spiritual light of Rabbi Nachman of Breslov to Safed would benefit the whole world. Accordingly, he decided to build a Breslov Torah community in Safed. After their father's unexpected death in 1980, Rav Elazar Mordechai Kenig with the help of his two brothers continued their father's vision. 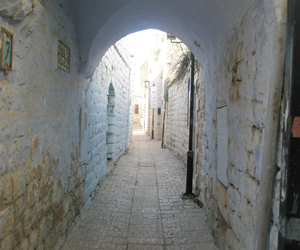 The building project took many years and the community is now one of the largest Jewish religious sects in Safed. The complex houses the synagogue, a Talmud Torah -elementary school, a yeshiva ketana -high school with boarding facilities, a children's nursery, and living accommodation for the members of the community. Within the synagogue building itself is a mikvah, a kollel -a study centre for married men, the yeshiva ketana, and a celebration (simcha) hall. With space for around 600 men downstairs and seating for over 200 women in the airy women's gallery, the synagogue attracts many visitors for Shabbat and the Festivals. Mincha prayers: 6.30pm followed by Kabbalat Shabbat and Maariv. Prayers last around 2 hours. Come early if you want a seat as there is standing room only in the men's section on a Friday night in summer! The prayers are very intense, serious, dignified and solemn and nevertheless very happy in the Breslov tradition. Times vary slightly but prayers begin approximately at 7am and last for about 3hrs. After prayers the Breslov community invite everyone to take part in a Kiddush for around an hour. While you enjoy the traditional food you can listen to interesting Rabbi Nachman stories, if your Hebrew is up to it. These seemingly simple stories hide a multitude of meaning and are very important to the Breslov sect. Shabbat Mincha: 5.45pm in summer, followed by the Third Meal, (seuda shlishit) with learning and stories in the Breslov tradition. Maariv after Shabbat: times vary depending on the learning during seuda shlishit. Mincha: 7pm during summer - winter times vary. Maariv: normally about 20mins after sunset. Winter:prayer times vary according to the sunrise and sunset. This beautiful new mikvah (ritual pool) has excellent facilities including a newly appointed spa with therapy treatments. There is a special preparation room for disabled women and a transportation chair for immersion if necessary. Brides are also given a wonderful experience in this fabulous mikvah that serves the whole of the Galilee. Hours are from sunset for 3 1/2 hours. There is no need to make an appointment unless you require the spa, bridal or disabled facilities. The excellent facilities for men include showers and several pools and are available from midnight until noon. No appointment necessary. This hall holds several hundred guests and enables you to have the caterer of your choice for your celebration. Around 120 married men study in the Breslov Kollel.